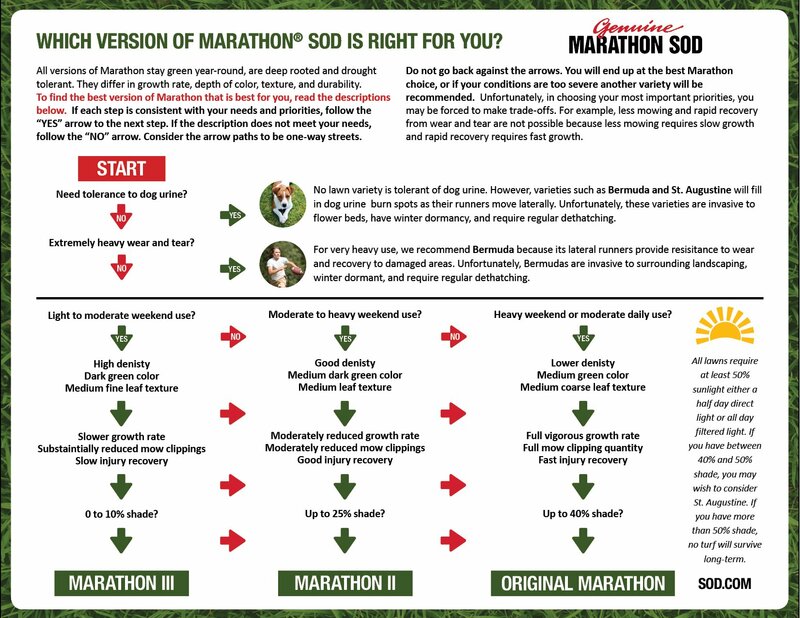 When deciding which Marathon Sod variety is best for your home, it is important to realize that Marathon I, II and III have progressively slower growth rates. The distinction is most obvious between Marathon I and III. Marathon III grows significantly slower, resulting in fewer clippings and allowing less frequent mowing. While this is an important advantage, it can also be a disadvantage. Think of turf as a self-renewing surface and growth rate as the speed of the renewal process. Slow growth results in more time needed for recovery from injury or disease. This means that if Marathon III is damaged it will show the brown spot longer. If the lawn is going to be subject to lots of play or traffic or adverse growing conditions, then the faster growing Marathon I and II are better suited. Where usage is light and appearance and fewer clippings are top priorities, opt for Marathon III. *Families who choose Original Marathon (Marathon I) like it for its all-purpose maximum durability. *Please note: Even though Marathon I is hardy, no grass will hold up well to dogs! *With its slightly more refined appearance and high durability, Marathon II is the most popular choice of Southern California homeowners. *Marathon III is the state-of-the-art dwarf fescue combining slow growth and a rich, dark green carpet-like appearance. However, because of its slow recovery from injury, we do not recommend it for everyone. Remember, Marathon Sod is made up of thousands of tiny live individual grass plants. They need to have a minimum level of food, water as well as sunlight to survive. Too little water will cause dehydration burn. An irrigation system is an absolute must! Too much water, or watering at the wrong time, can cause disease problems; Also too much fertilizer can burn the grass. Less than four hours per day of direct sunlight is too much shade and will cause yellowing and thinning. Please refer to our Maintenance and Troubleshooting Guide for more information. No sod, including Marathon, is immune to burning from dog urine. While some people seem to have fewer problems than others do, urine burn does not vary significantly by lawn variety. Rather, it is more related to soil moisture and weather. Wet lawns do not burn as easily as dry lawns. Hot, dry days increase the likelihood of burning. Winter dormant creeping turf varieties such as Bermuda, Zoysia and St. Augustine will recover from burn by sending runners to fill in the spot. Marathon does not produce runners and will not readily fill in burned spots. Should a problem arise, Marathon Sod carries a One Year Free Replacement Guarantee contingent upon proper installation and minimum level of maintenance.